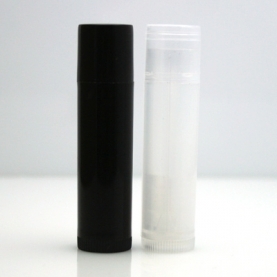 Tubes for lip balm, body balm, body butters, and more! Twist-up base (propel/repel) allows your product to be evenly and cleanly dispensed. Capacity is .15 oz. (4.25g), height of 67mm, diameter of 16mm. Tube is manufactured of polypropylene with 35% post-consumer recycled material. Tube is recyclable - recycle code #5.